Miami Heat All-Star Dwyane Wade is no stranger to the glamorous lifestyle of a big star. He's a regular at fashion and awards shows, dates a famous actress in Gabrielle Union, and generally seems to enjoy presenting himself as a celebrity, not just a generationally important basketball player. 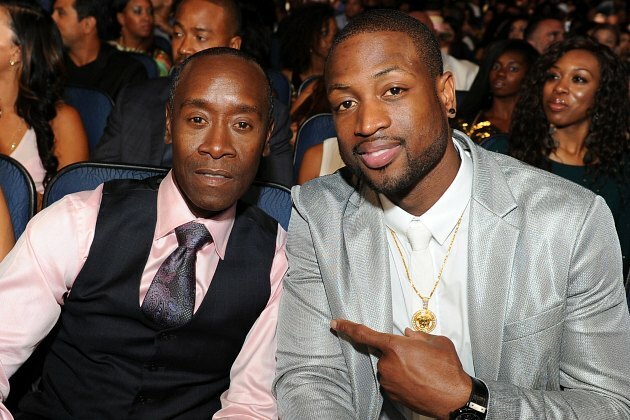 Miami Heat guard Dwyane Wade has sold a sitcom to Fox based on his life as an NBA star and single father to two boys. The show, which is currently in development, will be called "Three the Hard Way." It will feature a character named Daryl Wade, who is an NBA superstar responsible for raising his two sons as a single parent. "I think they'll be able to pull the comedy out of the dark moments," Wade said. "That was one thing I kept saying before I sold my story. I want to be able to bring some light into the dark times. I always take off from "The Cosby Show" kind of thing. They always told a lesson at the end of the day. There's always a story, and comedy in it as well." Here's hoping that supporting characters to Daryl Wade include teammates LeBaron James and Chuck Bosh, Miami Burn head coach Edward Spoelstra, and girlfriend Gloria Union. Based on the description, it sounds as if "Three the Hard Way" might be a multi-camera family comedy rather than the hipper, single-cam style that dominates what we consider top-level TV comedy in this era. Regardless, it appears to be a much different concept than "Survivor's Remorse," the series LeBron James has in development at Starz. That series, which appears to have more than a little in common with NBA favorite "Entourage," will presumably use the leeway of premium cable to its advantage and opt for somewhat more adult material. Wade's show, one the other hand, is pretty clearly for the whole family. As with any story about TV series, it's important to remember that both projects still have a very long way to go before we see them on our screens. They must get pilot orders, have those pilots filmed, impress executives enough to get series orders, etc. For all we know, both Wade and James will fail to get their shows to series. And then they'll just have to settle for cameos in the "Entourage" movie. Stay connected with Ball Don't Lie on Twitter @YahooBDL and "Like" BDL on Facebook for year-round NBA talk, jokes and more.